We’re in the home stretch and it’s INSANE to think that we have just about four weeks left to go before we meet our little one. Most everything is wrapped up and we’re just focusing on resting, preparing, and taking in these last few weeks of the bump. I’ll be back on the 1st with the nursery reveal and probably a couple posts after that but then it’s baby time! Feeling good still, just getting ancy and anxious! We are more than ready to finally get to meet this little one. 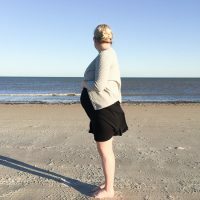 The third trimester swelling, uncomfortableness, and hugeness has definitely set in but I haven’t had any pains or complications so far, so knock on wood. Can’t wear a watch or my wedding ring anymore though. Well I can get it on, but off isn’t the easiest so to be safe it’s stashed away. Around the house we got a few to-dos checked off our general list and now are just trying to relax as much as possible. Of course, and they’ve even progressed almost exclusively to leggings or dresses. Probably gonna have to switch to sandals or flip flops soon as some of my cooler weather boots are a bit too snug thanks to feet swelling. This one is still hit or miss, lately it’s been alright thanks to using one of our king pillows as a body pillow. But my hips still get sore so I have to flip flop all night long and my hands go numb if they’re elevated too much. It’s been much better than I expected though. Same ‘ol, same ‘ol still…cheeseburgers, sodas, gummy candies, and anything cheesy casserole-y. A new development is craving sweets and I’m desperately craving cake and ice cream. I may need to whip up a chocolate poke cake soon! The soda thing is fierce and I resist as much as I can but man, they’ve never tasted soooo good to me for some reason. Thanks to the onset of swelling I gained 5 pounds in the last two weeks according to our doc yesterday, bringing me to 22 total which I’m pretty pleased with. She told me 25 lbs which I thought was so little but I’ve been spot on this whole time. I have no idea how with the cravings I have though, but I’ll take it! Definitely still an active little one but the loss of room has put a damper on the super weird flip and roll tricks it used to do. Now it’s just some kicks here and there, mainly on my right side, with some really stretching and digging in the ribs. Doc confirmed baby is head down yesterday so hallelujah there!! 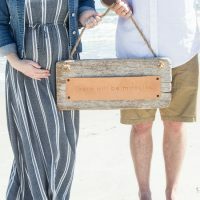 Taking our maternity pics at the beach last weekend! I was so happy when my wedding photographer, Rebecca McCoy Photography, said she’d be able to drive the three hours down and do them at the beach here. The weather ended up being perfect with late afternoon sun and just the right amount of seafog to make them look so magical. We got lucky and had the beach almost all to ourselves. She always captures us so perfectly and makes me feel super confident, even minimizing my nit-pickiness. I can’t wait to see the rest!! 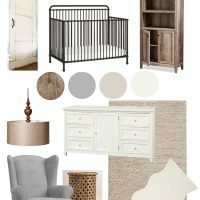 Revealing the nursery to you guys in a couple weeks and then having this baby!! I can’t wait to show y’all the space and then can’t wait to introduce you to that little one. It’ll be a little quiet around here till the reveal, but get sneak peeks on Instagram HERE! See y’all then! So gorgeous. I am so happy for you. Hang in there, it is all worth it. Ahh it’s getting so close!! Can’t wait to meet this little peanut!